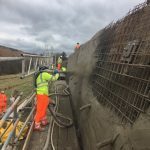 With a forward thinking approach, many cost effective solutions have been found to fix problems unique to the British Waterways canal network, ranging from to filling animal and badger sets. 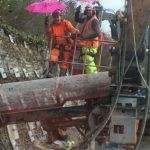 Condor Projects Ltd owns a range of specialist drilling, grouting and demolition machines, ideal for working within the transport infrastructure 24 hours a day, seven days a week. Working on listed structures, from canal locks, boundary and supporting walls to bell and clock towers, we are able to offer tailor-made solutions and work with sensitive materials, from lime mortars and specialist grouts to the fabrication of corroded steel and broken cast iron. All Condor employees are PTS Network Rail trained with work undertaken in cuttings, embankments and stations throughout the country. Use of Rope Access together with specialist drill rigs makes all areas accessible.